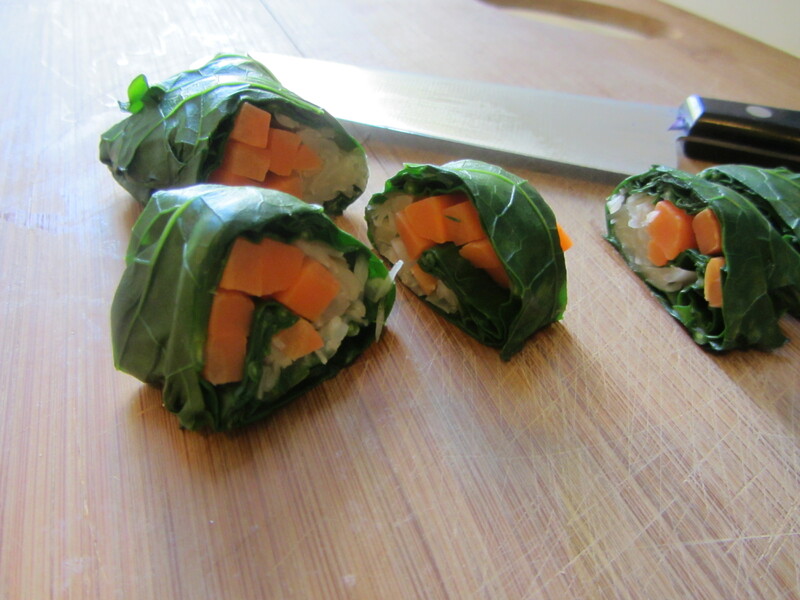 I am on a roll with rolls…. I love the form and it seems right for the season as the cooler weather invites us to focus inward as we curl up in blankets and wrap ourselves in warm clothes. 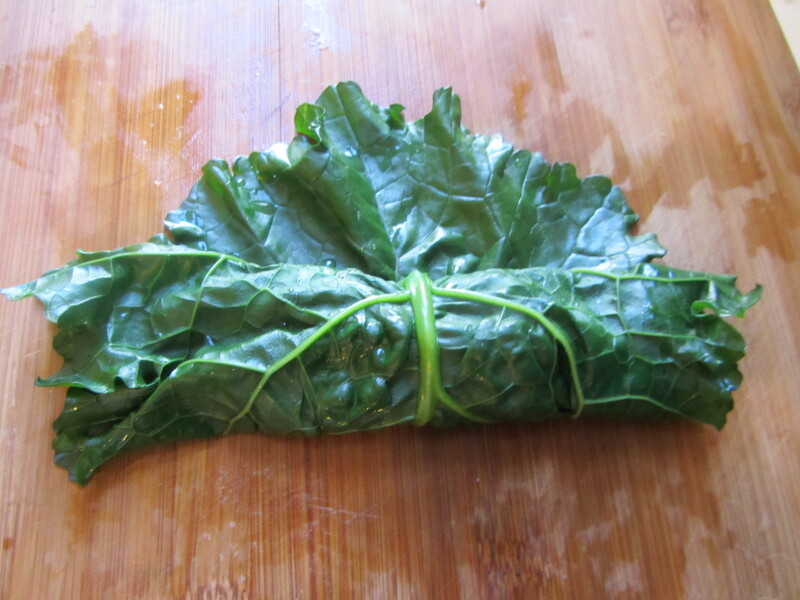 I picked these big kale leaves from my garden and was washing them when my daughter came into the kitchen and began shooting pictures. She helped me create this dish, and she shot many of the pictures here. I am also grateful to her for giving them a thumbs up and eating them all up! 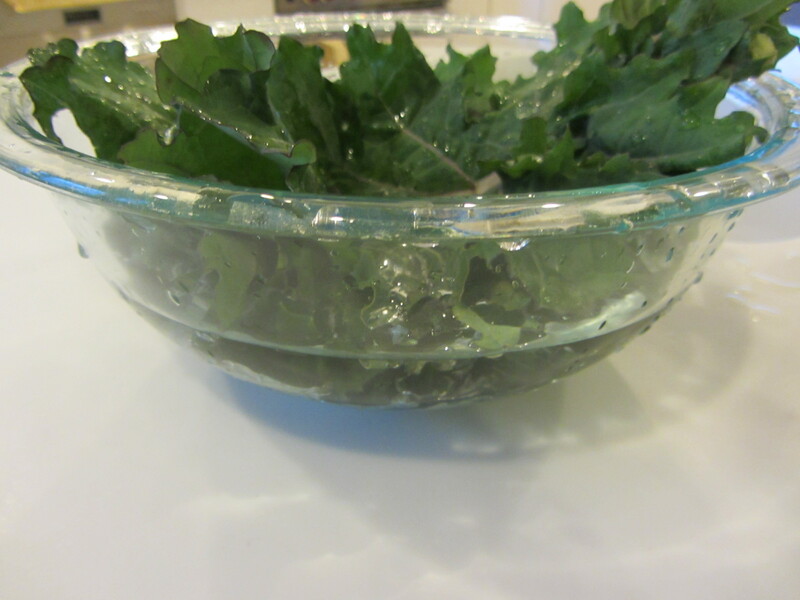 Process Wash the kale leaves well by immersing them in water. Clean the carrot, removing the ends and any tiny hairs; then wash it. 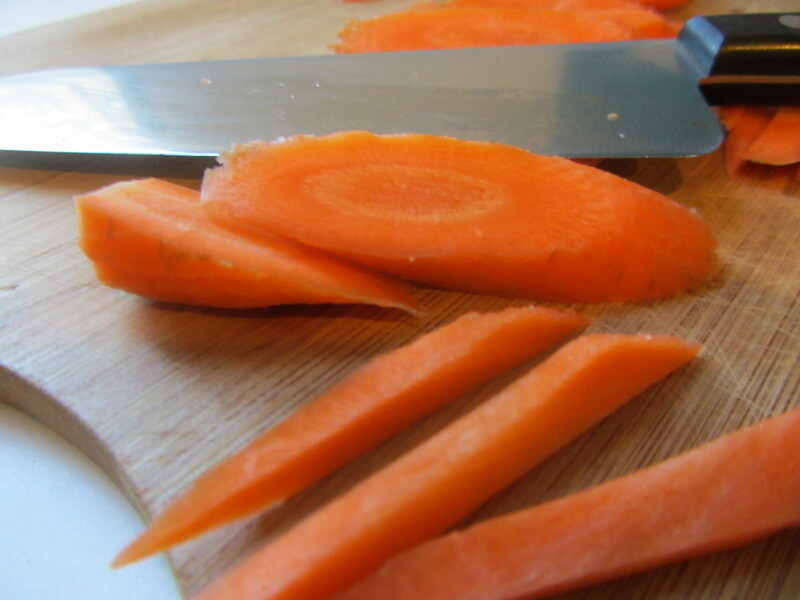 Slice the carrot into quarter-inch-thick ovals, then slice the ovals into matchsticks. Set aside. Fill two pots with water and a half-teaspoon of the sea salt: one large pasta or soup pot (for the kale), and one small pot (for the carrots). Place on a medium to high flame. 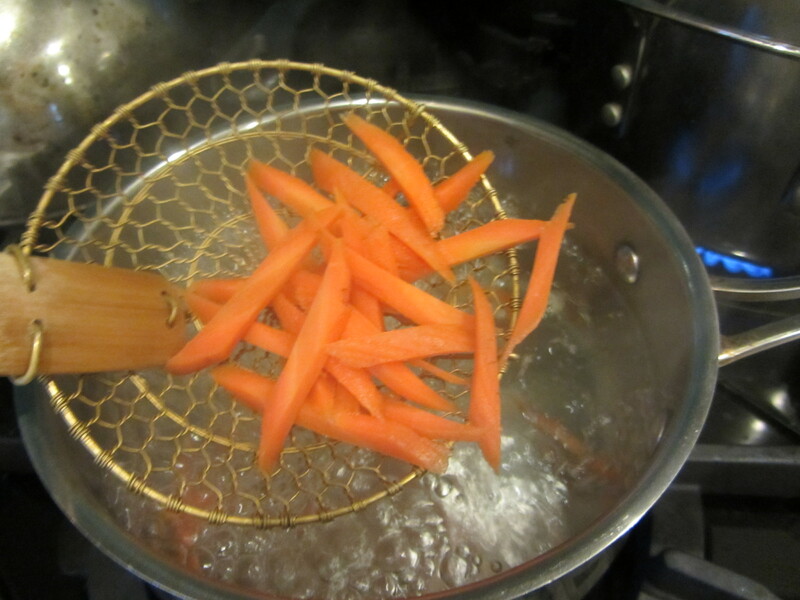 When the water is boiling vigorously, place the carrots into the smaller pot and the kale leaves into the larger. 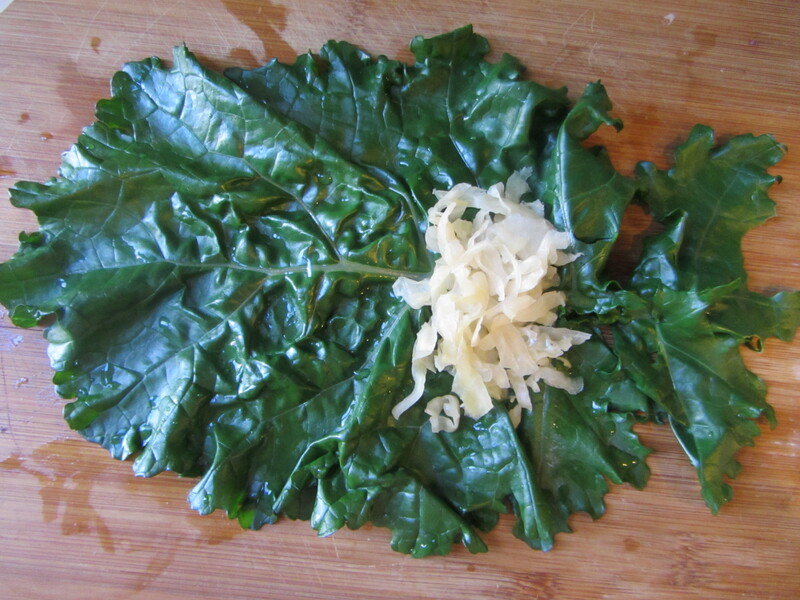 Be careful with the kale leaves as they need to remain intact. 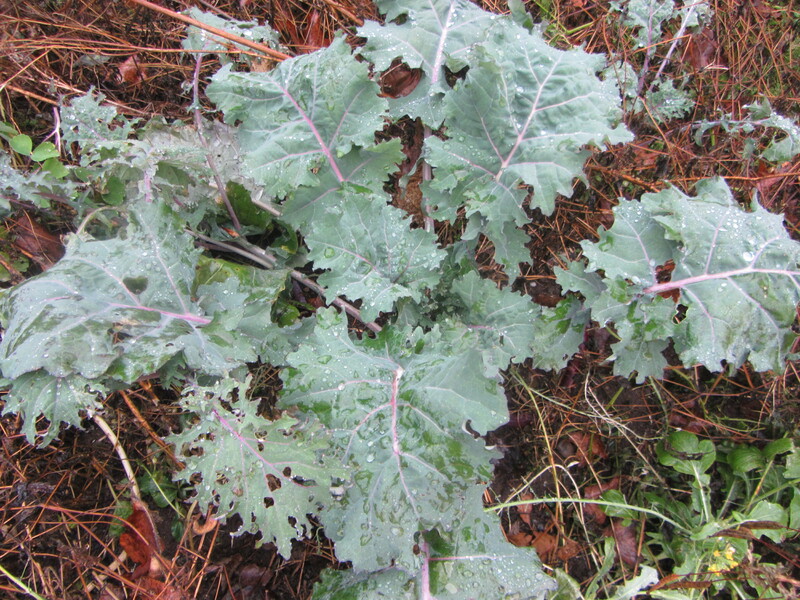 The kale leaves will be ready in about 30 seconds, when they soften and turn a deep shade of green. 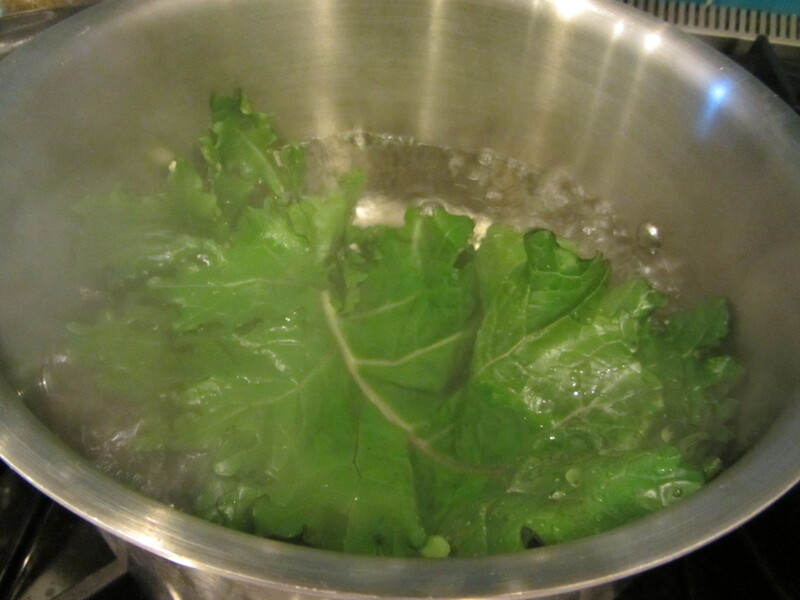 Note: do not put more than 3 kale leaves into the pot at once as they may not remain intact. and set aside, allowing them to cool. 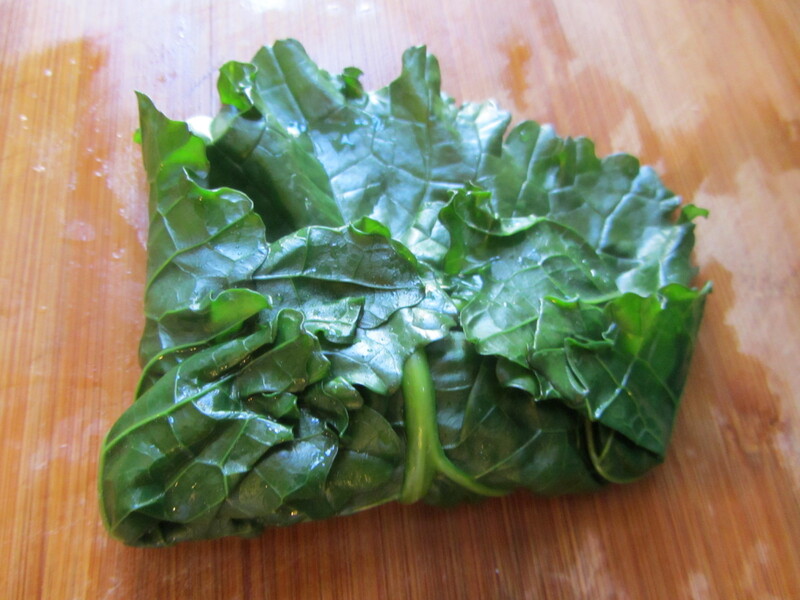 Position a cooled kale leaf vertically on a clean cutting board. Cut off the tough stem at the bottom. 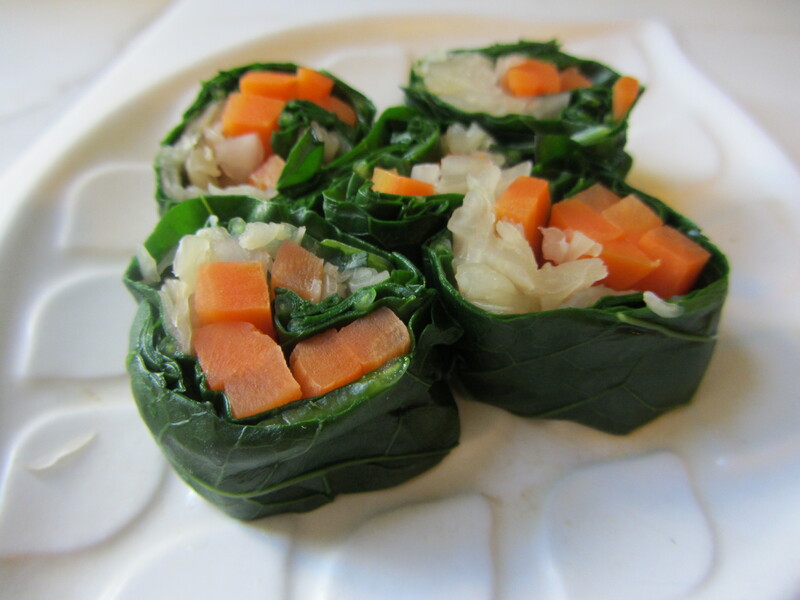 Place one Tablespoon of the sauerkraut in the center of the leaf about 2 inches from the bottom. Place 4-5 of the carrot sticks on top of the sauerkraut. 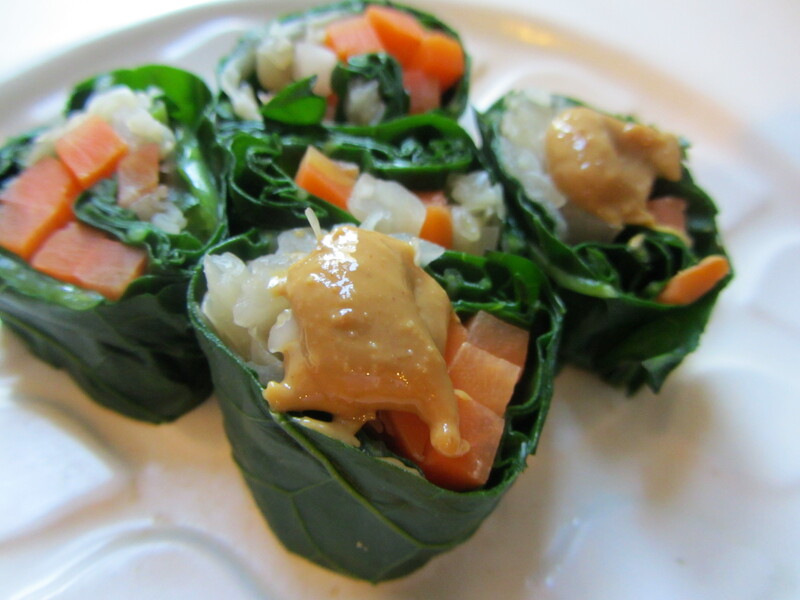 If you are using peanut butter you can spread it on top of the carrots now (or place a dollop on top of the finished roll, as shown below). 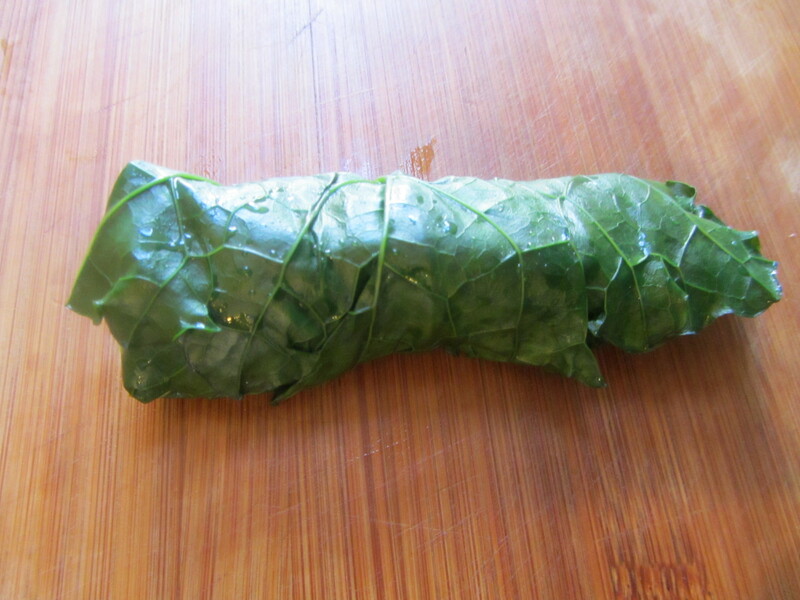 Begin rolling the kale leaf upward into a tight cylinder. When you are almost at the top, fold the sides in. Finish rolling the cylinder and then squeeze it, removing any excess water. and serve with peanut butter, soy sauce or umeboshi plum paste.